There, I’ve said it. At Travis CI, we all like a great cup of coffee (emphasis is on great!). We appreciate a good flat white (or flattie) just as much as a freshly brewed filter coffee. But during summer, the heat calls for something different though. In our first newsletter last year, we introduced you to the iced AeroPress. Since then, I’ve added a few more brewing techniques to my repertoire. One of them is the cold brew. 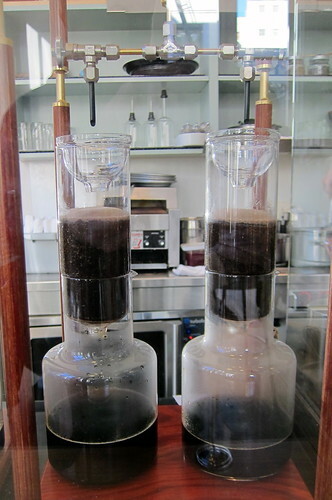 While there are the going-all-out versions like this terrific contraption at Blue Bottle’s Mint St. shop in San Francisco, there are simpler versions out there, much more suitable for the little home brewer like me. Making cold brew at home is surprisingly easy. All you need is some coffee grounds, fresh water and a jar. You put the water in the jar, add the coffee ground, put the glass in the fridge. It’s that easy! The result is pretty amazing. The slow steeping process brings out the full flavours of the coffee, making cold brew very suitable for Ethiopian or Kenyan coffees, known for their fruity flavors. I’m currently using the Ethiopian Kochere from The Barn in Berlin. Yirgacheffes are among my favorite coffees out there, and the Kochere is no exception. Use 9 grams of beans for every 100ml water, fresh beans are a must. Pour water into a jar. Mason jars are great for this purpose, but any glass that closes properly will do. The bigger, the more cold brew you can make in one go. Give the whole thing a good stir. Put in the fridge for at least 12 hours. The longer the better, but overnight works quite well. Sift the brewage. This is a bit tricky, and I don’t recommend using paper filters. A cloth or a cloth filter from the Hario drip pot work much better. It’s also good to pour in batches, as lots of tiny sediments will collect in the filter, making the draining slower and slower.